This is a simple, stylish idea for fuss-free entertaining – with very tasty results. drizzle with the olive oil. Season and toss together to coat. pesto sauce, about 3 basil leaves and a quarter of the grated Grana Padano. of the vegetables. Season, then drizzle with a little more olive oil. with a sharp knife - the juices should run clear. 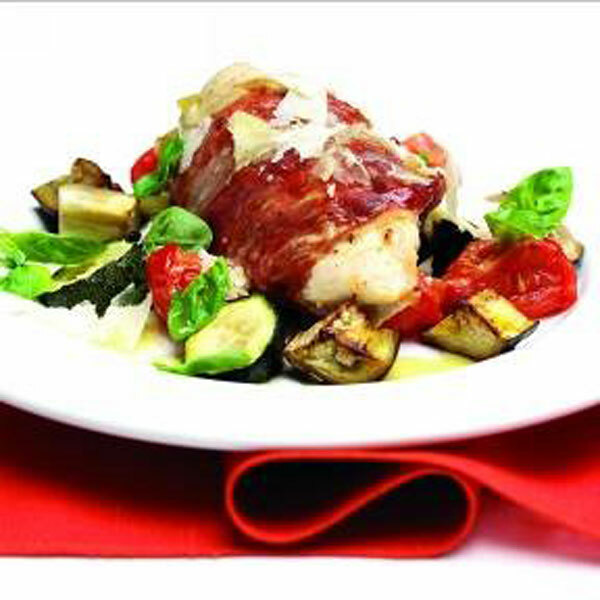 Cook’s tip: As an alternative to the chicken, use skinless cod loin or sea bass fillets. Spread them with pesto and top with basil leaves and grated Grana Padano before wrapping them in the prosciutto. Reduce the cooking time to 20 minutes.